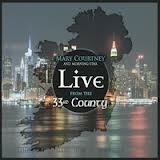 A look at albums we have written about in 2013 – here’s Mary Courtney and Morning Star and their 2013 release ‘Live from the 33rd County’ taken from Irish Music Magazine. No stranger to album releases the Castlegregory native, now firmly ensconced on the East Coast of America, with her band Morning Star (which comprises of John Redmond on accordion and Tipperary native, Donie Ryan on banjo), they are a regular on the music scene in the USA and this latest release Live from the 33rd County is a reflection of their entertainingly raw depiction of the genre. The track choice on the album has a wealth of songs designed to connect with the imagery of the homeland they departed. Mary intersperses these classics with songs of social conscience. The likes of Danny Hannon’s soulful Mandela ,which he wrote after travelling to the Yankee Stadium in New York to be inspired by the man himself, is performed with an emotive passion and this same passion stirs through the Tommy Makem penned Four Green Fields. The bodhrán adds a haunting pulse to As I Stand On This Land where the vocal becomes moody and pensive and the lyrics dig to the very core of the intensity of song that seems firmly embedded in Courtney’s character. The box and banjo of Morning Star create a voluminous sound as they plough into The Flowing Star set. Yet it’s the rousing lift in Sheila Coyles that brings their instrumental expertise to the fore as they swiftly flow into The Floggin’ and end with a highly excitable version of Sporting Paddy. This album is most certainly live. It has that unique, edgy rawness that typifies the all–round experience of a gig. So instead of leaving the home for a listen, just put your feet up and enjoy.